A major food processor in Iowa was considering upgrades to their tank cleaning system. Their current cleaning operation started at the kitchen and continued through the filling line. It was a labor-intensive system that adsorbed an entire shift each operating day, used large crews to clean multiple vessels (80), and generated large quantities of wastewater. Furthermore, it was supplemented by a clean-in-place system primarily used in the larger vessels that followed cook kettles in the kitchens. 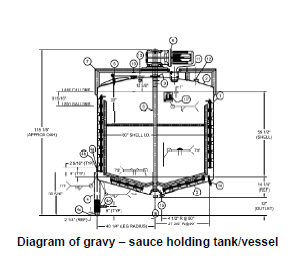 To help find an upgrade solution, a 1,200-gallon mixing and holding vessel used to mix various gravies and sauces (see illustration) were selected for prototype testing. 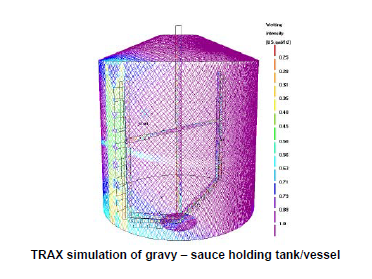 Alfa Laval rotating jet head equipment performance in the vessel was then compared to the existing CIP procedures and manual cleaning. After significant prototype testing with impressive results, the customer purchased the low speed versions of the two-nozzle Alfa Laval Toftejorg SaniJet 20, with 3.8mm nozzles, permanently installed at a depth of 700mm. cleaning. The wastewater volume for this vessel per cleaning cycle has been reduced by up to 80 percent and the manual intervention during cleaning has been eliminated. This customer also has a safer tank cleaning system as caustic and acid solutions are no longer used when cleaning this vessel. The results are clear. The vessel is cleaned of viscous food product, including its agitator and internals, and sanitized using only hot water at a flow rate and pressure of 30 GPM @ 80 PSI in 6 to 10 minutes compared to hours of manual labor/cleaning with chemicals. The SaniJet 20’s have been operating for over a year without further intervention or adjustments.